M & J Builders Merchant is an authorised stockist of leyland paints, as well as other leading brands including Crown, Macphersons and Sandtex. You will find a huge range of paint products from the latest contemporary colours to all the standard whites and magnolias you could ever need. 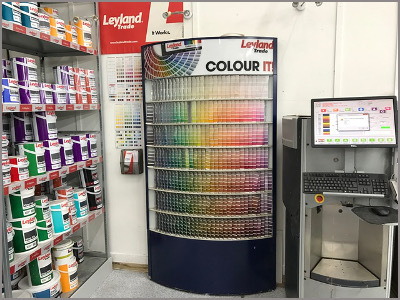 Our specialist paint centre can mix over 16,000 colours in various finishes including vinyl matt through to exterior masonary paint. Our facility also uses the latest technology allowing us to colour match existing paints required for your project. and all the tools to complete the job, from brushes and rollers to ladders and dust sheets.